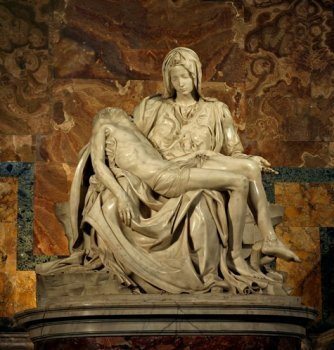 The Pietà in St. Peter’s Basilica, Rome, Italy. A vandal once took a hammer to the Pietà. It was a shocking and unexpected event, but the fact that it happened suggests a perverse streak within our nature to desecrate that which others revere in order to gain attention for ourselves. That the vandal could not himself have created an object so sublime did not mean that he could not, with a stroke of a hammer, indelibly mar its beauty or offend its admirers. Such is human nature, and such is tragedy. As individuals, institutions, and cultures, we are all sometimes vulnerable to tragedy through no fault or volition of our own. Tragedy is not inevitable, but the confluence of political opportunism, ethical narcosis, and moral malaise that dominate and subvert American culture have ripened the opportunity for our political leadership to do what no enemy has done in 217 years – sully the reputation and honor of our proud Corps. While homosexuality is a tragic reality, and those who indulge in its indignities deserve prayerful compassion, they are not fit to lead men in battle. Culture vandals may debate this issue, but as Marines we know this intellectually, morally and viscerally. For the civilian, this may be but one of the many irreverences that he has endured as a member of the declining culture, but for the Marine it is a violation of a sacred trust. We have always perceived that the threats to our honor were external to our borders and could be countered with courage, zeal and competence. We never suspected that the threat to our ethos would come from within our Nation and be sanctioned, however indirectly by the American people. The sorry fact is that this will not be a gross betrayal by a dark and sinister force – rather it will be a culmination of banal evils from a progression of noxious ideologies. The result will be the same, only the intent is more benign. When men reduce their virtues to the approximate, then evil acquires the force of an absolute: when loyalty to an unyielding purpose is dropped by the virtuous, it’s picked up by the scoundrels – and you get the indecent spectacle of a cringing, bargaining, traitorous good and a self-righteously uncompromising evil. Soon, we must again answer an important question that has frequently been asked in the past: Do we really need a Marine Corps? 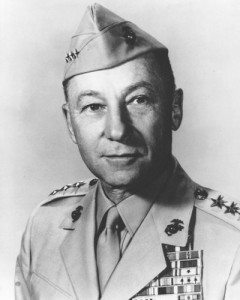 As we know, Lt. Gen. Victor H. Krulak answered that question in his book First to Fight: America does not need a Marine Corps – the other Services could manage an adequate defense without us – but America wants a Marine Corps, because it feels safe knowing that there is a band of warriors always ready to respond rapidly, against unknown odds, to any national emergency. America felt good knowing that men of character, who shared a warrior ethos, stood ready to do its will. But some of America has changed its mind and now seems to regard virile virtues as a vestigial encumbrance upon a society that prefers dissolute equality over honest distinction. Perhaps now is the time to recognize that although America might, for the first time need a Marine Corps, it no longer wants one. It is true that the future portends many littoral conflicts to which a Marine Corps should respond, but the other Services will adapt. They will certainly adapt better to amphibious warfare than the Marine Corps will adapt to recruiting sexual deviates. Marines are an incredulous lot by nature, and brutally honest in their observations and decisions. The young officers who attempt to explain how homosexuality is an “alternate” instead of a deviate lifestyle, will quickly lose the respect of their Marines and a bit of their own honor in the process. Sanitized terms like “sexual orientation” may serve to obfuscate the gross realities of a perverse lifestyle to a jaded public, but Marines living in a barracks will rightfully question leadership that discredits by association the sacrifices they are willing to make. The party line will be that homosexuals are Marines, just like you. The cognitive dissidence that this simple, yet official, lie must engender will tug at the credibility and ultimately rend the integrity of our Corps. The official emblem of the Marine Corps – the Eagle, Globe and Anchor. We dare not tarnish the reputation of our Corps. Too many valiant men have fallen in honor for us to allow the term “Marine” to be degraded in a futile attempt to lend dignity to practitioners of unnatural acts. It is time to case the battle colors and ask Congress to disband our Marine Corps. The Army has long sought the Marine Corps as its own, and in many of the world’s navies there are naval troops. We can preserve our reputation, and that of those who have preceded us, by not compromising our values as a Corps. We should transfer our personnel to another Service and don their uniform. It is better to wear proudly the uniform of another Service than to see the Globe and Anchor progressively defamed. As we know, the Marine Corps is not essential for national defense; it is an expression of pride and competence by a strong people. America is our home and the home of our families. There is still much here that is worth defending. By disbanding now we preserve more than a tradition of honor and service – we preserve a remnant of hope for a future generation. There will be time in the future, as there has always been in the past, when America will be threatened. Survival may become a dim prospect, and ancient virtues and values will be recalled. From such a crucible may emerge a neophyte warrior who remembers that his grandfather, or perhaps his great-grandfather, had been a sergeant major of Marines. 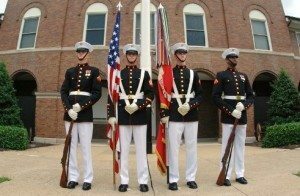 United States Marine Corps Color Guard, Marine Barracks, Washington, D.C. 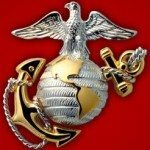 If he is confident in his fellow warriors, loyal to his country, resolved on victory, uncompromising in integrity, and dedicated to both innovation and tradition, then he may have the audacity to claim the title “Marine.” Once again, America will want an elite corps of honorable men to do the difficult today and the near impossible tomorrow. Old battle colors, dusty but unstained, will be unfurled, and proud men will commit their lives to God, Corps, and Country. They will inherit an unblemished tradition, and what will provide the continuity between our Corps and theirs will be a common motto: Semper Fidelis! It will be the intervening years, when there wasn’t a Marine Corps, which will validate for all time the motto itself. This article is reprinted courtesy of the Marine Corps Gazette and copyright is retained by the Marine Corps Gazette. By publishing timely articles dealing with this subject, we have no intention to defame or disparage anyone. We are not moved by personal hatred against any individual or wish that any language used be perceived as such. In intellectually opposing individuals or organizations promoting the homosexual agenda, our only intent is the defense of our hallowed Armed Forces, the family, and the precious remnants of Christian civilization – The American TFP. This entry was posted in Fighting the Culture War by Colonel David Bolgiano. Bookmark the permalink.